As you can see this fish steak is cut vertically from a largish sized fish and it is the perfect size to stud the four different sections with different flavours. On this occasion I used fennel, cloves, garlic and mint. I vary the flavours and I may use rosemary, a bit of cinnamon stick or lemon peel. I was pleased and surprised to find that the Trevally had been cut into steaks because it is usually only available whole or as fillets. It is pleasing to see that there is a growing awareness that fish, like meat, can be partitioned into different cuts that lend themselves to different styles of cooking. Silver Trevally is also called White Trevally and has a firm, dense texture when cooked. It benefits from a little liquid to deglaze it after it has been seared and can taste dry if it is overcooked. I used a combination of white wine and Sicilian Marsala Fine – semisecco (semi dry). At other times I have used just white wine or fresh orange juice (with a little grated peel) or dry vermouth. I like to use dry vermouth particularly when I use tarragon – this is not a Southern Italian or Sicilian herb but it is used in the North and known as dragoncello -little dragon. Sage (salvia) is also good to use, but once again it is not widely used in Sicilian cooking. Silver Trevally is fished in estuaries and coastal waters of southern Australian states and most of the Australian commercial catch is taken in NSW and eastern Victoria. Not much detail is needed in this recipe – the photos tell the story. Use a thin, sharp knife with a long blade and make slits into four sections of the slice of fish. Insert into each split half a clove of garlic and three other different flavours. Select from: fennel, cloves, mint, sage, rosemary, a bit of cinnamon stick or lemon peel. .
Heat some extra virgin olive oil in a frying pan that can accommodate the fish in one layer. Sprinkle the fish with salt and pepper. Sauté the fish, turn once (until it colours). Add Marsala and white wine (about 1/2 cup) and evaporate the liquid leaving the fish in the pan. A bit of fish butchery at a fish market in Sicily where butchery has been going on for centuries. The sustainable albacore tuna (better choice category in the Marine Conservation Seafood Guide). As you might expect many Sicilian fish recipes are for the aristocrats of Sicilian fish – the blue-fin tuna and swordfish – but these species have been overfished and are no longer sustainable, not just in Sicily, but worldwide. A century ago in Sicily, during tuna fishing season, it was easy to catch thousands of tuna, each weighing approximately 300 kilograms, but their numbers have fallen drastically. Unfortunately, the situation with swordfish (pesce spada) is much the same as with blue-fin tuna. Once it would not have been unusual for fishers to haul into their fishing boats, swordfish measuring more than five metres long. Now, especially in the Mediterranean, stocks have rapidly reduced due to overfishing. 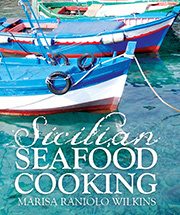 For all the Sicilian recipes intended for tuna and swordfish I use the sustainable albacore tuna. My vendor stocks it when he can get it, but not all fishers are interested in catching it because it does not fetch high prices – it is not in demand as an export to Japan (where tuna is preferred eaten raw and red) and therefore it is the cheaper alternative. I have sometimes seen albacore tuna for sale at only one other stall at the Queen Victoria Melbourne Market – it has never looked appealing; it has been cut roughly and with high proportion of red flesh. When I am able to purchase it from my vendor (Happy Tuna Seafood), he has either cut it into quality thick steaks, or as a larger fillet left whole, or in a vertical slice from the centre of the tuna (see photo). This cut is called a rota (in Sicilian). In Italian the word is ruota – a round or a wheel. I have stuffed the slices of tuna with garlic and rosemary. The rota is cooked in one piece and is separated into portions when it is ready to serve. I have found the slices of tuna I purchase in Australia to be smaller than those I remember in my childhood and will only feed 2–4 people. I remember my grandmother Maria in Catania cooking a very large rota of tuna during one of our visits to Sicily. It must have weighed about 2 kilos and it fitted very tightly in a shallow fry pan (an indication of how large the fish once were). The pale flesh and versatility of Australian albacore tuna is very under rated. It is known as the chicken of the sea – the flesh turns white when cooked. I generally braise albacore tuna, usually with tomatoes, capers and herbs. I always insert flavours into the flesh (slivers of garlic, herbs or cloves). Sometimes I use white wine, but on this occasion I softened some onion in some extra virgin olive oil, sealed the slices of tuna and then added some dry marsala , orange slices and bay leaves. When I am braising food, I always cover the pan with a lid and cook it slowly. Both of these species of tuna are wild-caught, but catch rates are declining so they are in the think twice category (Marine Conservation Seafood Guide). Big-eye is the second most popular tuna for sashimi and unfortunately numbers are declining very fast. Southern blue-fin tuna always seems to be available for purchase. This is because much of it is farmed, but some is wild-caught. We need to say no (Marine Conservation Seafood Guide) to the most popular species of tuna because it has been severely over-fished in and outside the Australian fishing zone. Most are caught wild and then fattened in sea-cage aquaculture farms, especially around Port Lincoln in South Australia. For a long time I had thought that fish produced by, such as tuna, ocean trout and salmon was sustainable and was surprised to find that the Marine Conservation Seafood Guide totally apposes sea-cage aquaculture – penned, dense schools of fish in large floating cages moored in bays and estuaries. • Tuna farming is a large and profitable industry and it involves herding juvenile tuna from the wild into pens to fatten in cages – it is called fish ranching. • Fish farms are established in bays and estuaries to avoid damage from storms and currents and they need clean and frequent water exchange. Unfortunately other wild fish and marine life also favour these and their habitat is affected. • Significant amounts of waste can be discharged from fish farms back into the ocean – the nutrients in unused fish feed, fish faeces and the chemicals and pharmaceuticals used to keep the fish healthy and the pens clean. These can be toxic to many aquatic species and impact on the surrounding environment. • There is also the potential for some farmed fish to escape. These could spread diseases and can threaten local, wild species by competing for food and habitat and interfering with their breeding. • Farmed tuna are fed large quantities of wild, whole fish (pilchards, sardines, herrings and anchovies, chosen for their high oil content and mostly imported). Penned tuna are fed three times a day, whereas in the wild, they may eat once a week. 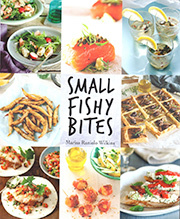 In the hands of an able cook, fish can become an inexhaustible source of perpetual delight.